"The Lysander that crashed in my 11 acre field"
The 6th August 2002 will be the 60th anniversary of an event that made a local farmer into a hero. It was mid-day in the summer of 1942, and farmer Mr. John (Bob) Walker would have normally been returning to his house at Villa Farm Boothferry, for his lunch, but this day he had continued working, with his two horses in his eleven acre field between Booth and Knedlington. It was the horses behavior that first drew Bob's attention to the aircraft, that was flying unusually low and heading, on a collision course, straight for some overhead cables that crossed the field from Boothferry Bridge to Knedlington. The aircraft came through a gap in Winters Wood, from the direction of Howden Dyke its landing wheels just touching the top of the wheat corn. At first Bob Walker thought the aircraft was attempting a landing by flying under the cables, but just when it looked that the aircraft would do it, the aircraft lifted and flew slap bang into them. The plane, a Lysander (L4795) of 116 RAF Squadron was on an calibration anti-defence system flight and had probably taken off from RAF Leconfield near Beverley that morning with a crew of two. The pilot, Flying Officer Ralph Emerson Jenkins, in the front seat, and Sergeant John Hawksworth, the wireless operator/rear gunner in the rear seat. The dramatic account of what followed is best told by quotations from the story told by Mr. Walker to his family over the years, about "the Lysander that crashed into my eleven acre field and ditch three hundred yards away from me". And followed by the recollections of the rear seat occupant of the aircraft, Sgt. John Hawksworth, who years latter wrote his memories of that day in a letter to one of Mr Walker's sons, Barry. "I suppose I should have been frightened but it did not seem real," recalled Bob Walker. "My two horses, on the other hand were terrified, they were only young. I could not believe what I was seeing, the little plane fell apart as it cart-wheeled, tail over wingtip, across the field, pieces breaking off and scattering all over the place until it came to rest in the dry ditch." Stopping only to tether the two horses Bob Walker ran across the field to the crashed aircraft.
" Everything was quiet now apart from the airman who was trapped by his harness in what was left of the aircraft. At first I though he was German, and then it dawned on me, what sounded like German was Anglo-Saxon swearing." The surrealism of the situation he now found himself in stayed with Bob Walker for a very long time. "There was I laid in the bottom of the ditch, surrounded by aircraft wreckage that stank of petrol, trying to cut this young lad free of his harness with a knife which I could have ridden (censored) to London on, because I could not operate the release box, and trying to stop him from further damaging his injured right hand as he tried himself to release it, dangling helplessly upside down, he was barely conscious but still furious. He called me a useless so and so and told me to **** off". I told him, " If this bloody thing sets on fire, I'll **** off all right, but I doubt if thou will". When for no reason that Bob Walker knew of, and most certainly nothing to do with his efforts with his penknife, Sgt. Hawksworth suddenly fell free of his harness on top of Mr. Walker who was now pinned in the ditch bottom by the profusely bleeding body of the airman (it would seem in retrospect, Bob Walker had indeed operated the harness release mechanism correctly, but the weight of Sgt. Hawksworth's slumped body had prevented the release clasp from springing open). <Picture of Sgt. Hawksworth in flying gear, from the Nottingham Evening Post. Struggling to disentangle himself, and now motivated by the strong smell of aircraft fuel and the sight of ammunition Bob began to pull Sgt. Hawksworth clear of the wrecked aircraft, some pieces of which was smouldering alarmingly. By this time some other people had arrived at the site of the crashed plane, some workers from the flax mill, on Knedlington Road, four Land Army girls who had been working in an adjacent field, and a Mr.George Arthur Shirbon who lived in Hailgate Howden, he had been in a field on the south side of Boothferry Road when heard a rustling among the corn. Looking up he saw the aeroplane only a few yards away coming towards him at corn level. He dropped his bicycle and fell on it as the plane passed over him. Between them they carried Sgt. Hawksworth back to the flax mill yard where he was given a measure of first aid by Dr.Wigglesworth (senior) of Howden, prior to being taken to York Military Hospital. Rescuers found the body of the pilot, F/O Jenkins later. He had been thrown from the aircraft on impact and his body had landed away from the main wreckage, unfortunately he was already dead. In April of 1986 John Hawksworth wrote a letter to the Goole Times thanking the local people who had help him over 40 years before. He had attempted to write such a letter years earlier but had held back, but now at 68 years of age he felt it was right to do so. Barry Walker saw the letter and replied to the Goole Times saying that his father had been one of those who had dragged the airman's injured body from the aircraft wreckage, and would have been pleased and surprised to hear of the man's recovery and his return to normal life. Unfortunately Mr. Walker had died in 1975. Please note this is only a brief extract of these letters as to print the full contents of both letters would take up to much space in this article. In 1998 Barry Walker (after much prompting by a friend, Mr. Alan Turner, who while researching aircraft crashes in the area had found Mr. Hawksworth's phone number), decided to get in contact with John Hawksworth on the telephone with the opening introduction, "I have known you for 56 years but have never met you!" Since then they have become firm friends and have exchanged many letters and phone calls, discussing the events of August 6th 1942. Thereby allowing Barry to see the story of the crash, rescue, and his hospitalisation from John Hawksworth's view and in own words. "Although much of the time I would be unconscious" John wrote to Barry, in a subsequent letter, "I was aware of the activity around me and I remember someone struggling and talking to me. This must have been your father getting me out of the wreckage. Later there was the cold feel of grass and the blue sky, with red rings around everything I could see and I tried to get up. The pain was indescribable. There was girl cradling my head. I remember pushing my face into her green woollen pullover in my agony. I still have a visual impression of her face against the sky, and still can feel the comfort she gave to me. I can also remember going past hedges and knew that I was on a stretcher because I could feel the studded nails and canvas under the fingers of my left hand. I felt every step the men took down that field path and I hope they forgave me when I swore at them. As I think of their worried faces as they told me that they could not help hurting me, as they put the stretcher into a little van." "I have always felt a little ashamed but I am sure they understood. After that I have a picture of a building in a yard and an elderly man bending over me, saying" "I cannot help him, he will die here." "I knew nothing else after that, until I momentarily came round-about five days later and I knew I was in a hospital bed. The smooth sheets told me! It was York Military Hospital, I learned much later".
" The extent of my injuries was such that Major Metcalf with a team of surgeons, doctors and nurses worked on me for about nine hours, into the night, in the operating theatre. My skull had a fracture near my right temple, with my face cut about a fair bit, my left leg was dislocated at the hip and almost torn off, my ankles had been 'stretched' and there were some big wounds in my knees with a few more here and there. My right hand had been smashed and had to be amputated up to the wrist but leaving the thumb intact. It took months of tender loving care by sisters, nurses and doctors before I was able to walk again, in York Military and the RAF Rancerby Hospitals and I still had months to spend in hospitals. At Queen Victoria Hospital, East Grimstead in Sussex, I became a member of the Guinea Club (Membership of the club cannot be bought by money and the price is so great that 'sane folk' do not deliberately try to qualify for membership) who are airmen injured flying, and treated in hospital, many of them terribly burned and so on, of all the Nations who were our allies." The lost of his right hand was a devastating blow for John who had been a talented artist and told one of his nurses (Nina Roberts) when he was at his lowest ebb that he would never paint again. Nina allowed his father to bring into the battle ward his art equipment and so John started to adapt to painting with his left hand. And eventually was able to enjoy a lifetime career as a lithographic artist. Barry Walker recollections of the event are quite hazy (being only 5 years old at the time) "I remember my father walking into the farm kitchen covered in blood and the reaction of my mother and aunty. They were unaware of the aeroplane crash and assumed that my father had sustained some dreadful injury. I thought it was paint and was unaffected by the fuss, as was my father who changed his blood stained clothing, then had a cup of tea before returning to work." 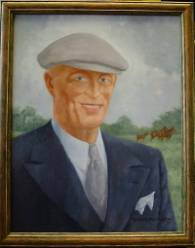 Since the time Barry Walker contacted John Hawksworth, John has painted an oil painting of Bob Walker as he would have looked in 1942. This he achieved by using photographs and the description from Barry and using his left hand. John also wrote an account of his rescue by Bob Walker in the Guinea Pig Club Magazine in 1999. On the 6th August 1998 Barry Walker planted a sycamore tree on the exact spot where Flying Officer Jenkins was killed in 1942. The seeds for the sycamore were taken from Rydal Mount, near Wordsworth's Dove Cottage in the Lake District. The Pilot, Ralph Emerson Jenkins is buried at St. John the Baptist Churchyard, Kirby Wharfe, near Tadcaster. This graveyard being near RAF Church Fenton contains numerous air force graves.